One of the things that amazes me most about American Crafts is their ability to continually come out with line after line of fantastic, on the mark products. The Blue Skies line is no exception. The line includes lots of cute retro-sweet forest animals along with complimentary classic patterns. Not to mention the adorable acrylic stamps, flair and, my personal favorite, Thickers! If you were looking for a cute little woodland creature to fall in love with, that was legal and clean to keep, look no further! 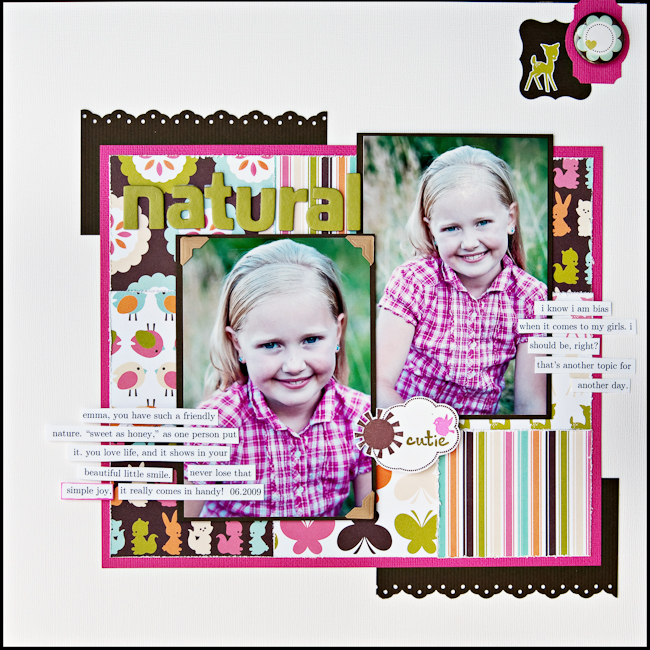 The line is super versatile and goes with everything from outdoor pages to girlie pages to spring and summer fun projects, and still colored well to head into fall. Blue Skies perfectly sized patterns are fabulously suited for card making projects, too. I did find that lightly sanding the acrylic stamps, with fine grit sandpaper, before use really helped get a clear impression. For all around great products that I reach for time and time again, American Crafts always has my back. I'm sure my husband is thanking them daily for that! I thought about shamefully admitting how many packs of Thickers are in my possession, but quickly decided to leave that to the imagination. What do YOU think? 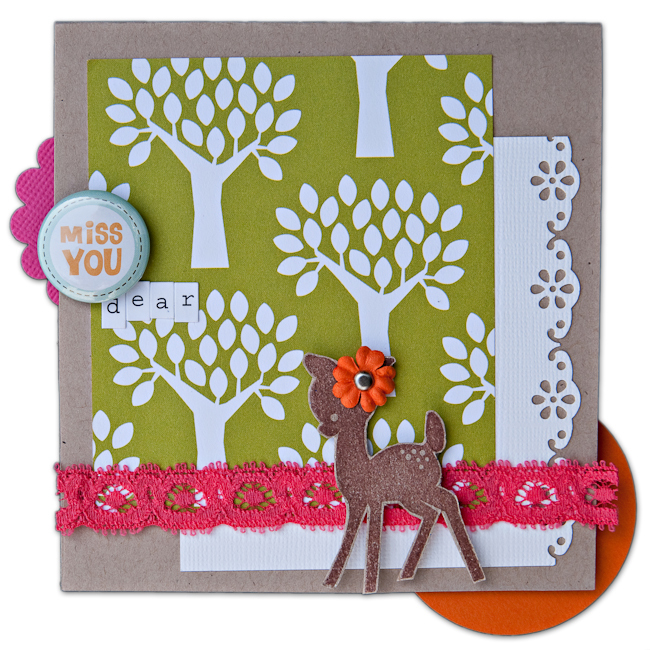 Are you loving the little retro woodland creatures, or is it a trend you could see out the door? Let us know what you think. ok, I'll be honest. While I love what you did with the paperline, I really don't like the line itself. I am so ready for the woodland creature trend to be OVER! I am with TraciL - I love the 2 layouts but the only stamp I might even think about using is the one that looks like the Fiskars apron punch or whatever its called. I love the Thickers - I desperately need a 12 step program. I adore ALL THINGS AMERICAN CRAFTS, and this line is no exception. Love it! noel, love your post! your girls are getting so big! beautiful job-as always!! i love these colors..YUM! and yes, thickers are some of my favorites too!! I'll give ya a nickel if you tell me how many Thickers you haaaaave...LOL! Love the projects, Noel. You truly rock the "retro woodland creatures". Sounds like a great t-shirt, eh? I generally love AC, but I am SO OVER all of the woodland creatures! Let's move on people!! I agree, American Crafts is one of my favorite manufacturers! I always look forward to seeing what they come up with next! And I am totally addicted to Thickers!!!! Great projects, Noel. The woodland creatures are cute, but not sure they are me. Still love owls, though :)! While I like what you did with the line, the woodland creatures trend is NOT my favorite! I hope to see this ending soon. I like the birds, but all the other stuff is very limiting! LOVE American Crafts - Thickers are my obsession! I collect them! I simply loved your hula hoop layout! Great angle for the shot and loved how you used the flair as an "o"! Very cute! Love your layouts, Noel. So fresh and fun! I love AC but am not very into the woodland creatures. I feel they can only be used for certain LO's and those aren't LO's that I am making! You did a great job with the products though and gave great inspiration. This looks like a really fun line to work with. I can think of plenty of pictures I could use this set with.